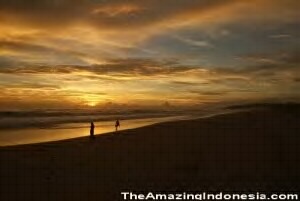 Pangumbahan Turtle Park is located in Cibuaya, Ujung Genteng, Sukabumi Regency, West Java. Pangumbahan Turtle Park is a beeding turtle park managed by local government and is one of the largest breeding parks in Indonesia. This breeding turtle is located in a very beautiful beach with powder sand, clean and when sun sets, the sky is like a beautiful painting. You’ll be amazed with the beauty of this virgin nature. 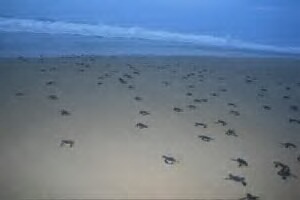 Around 4 pm, turtle kids, 4 months old, are released into the sea. The unique thing about this turtle habit is that they’ll be back in adulthood laying on the same beach where they were released. 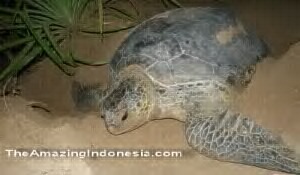 Around 7 pm o’clock in the evening, you’ll see the adult turtle lay their eggs. It turned out the turtle is afraid of light and humans. So, when she will lay eggs, it is highly guarded by the beeding park officers there. Even though visitors may see the turtle lay eggs, guards still have make sure that the turtle had been in a comfortable position for laying. Visitors are also prohibited from carrying a flashlight or an object that emits light like a camera. So, it is advisable to take photos at the time the turtle has finished laying. The eggs that she could give up to hundreds and will be taken by the officer to be breeded in a safe place. Those turtle are sea turtles that lay their eggs over the age of thirty years. Sea turtle eggs take between 52 to 70 days for hatching, depending on the wheater. If the rain season, slightly cooler sand will make the time to grow longer. Vice versa, if the wheater is hot, time to hatch is quicker. From a hundred turtle eggs, the possibility can survive until the age of thirty years in only one. Or it could be noone at all. By looking directly how turtle are breeded and seeing the natural beauty there, I’m now more appreciative of nature and living creatures that deserve preservation.